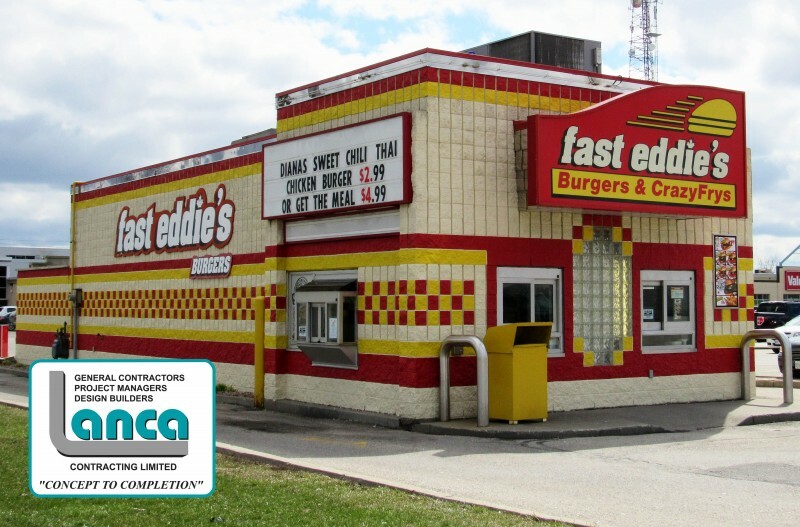 Fast Eddie’s – THEN & NOW – LANCA Contracting Ltd.
Fast Eddie’s was established in Brantford since 1987. 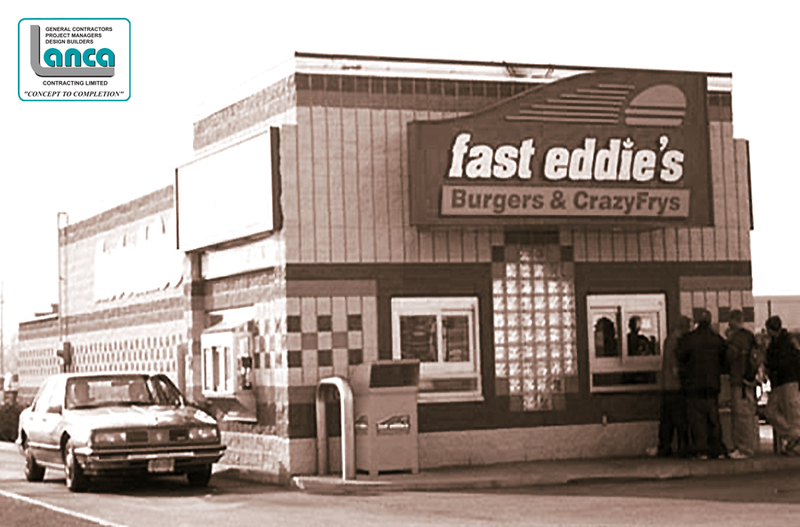 The 1st Fast Eddie’s franchise building to go up in Brantford was on Stanley St. and the second one was built by Lanca Contracting Limited on 55 Edmondson Street. This facility featured two drive up windows one on each side of the building and a walk up window at front of the building. The original paint job on the exterior was to give it a look of a patty with mustard and ketchup between a hamburger bun. Paint preferences changed over time but the present building looks very much as the original. Fast Eddie’s is just one of the many buildings Lanca Contracting Limited has completed on this Fairview Crossing. We also constructed the Tootsies Shoe Market addition, renovated Super A Video and constructed the Pennington’s 14+ retail stores. Lanca also performed a major addition and renovation to The Athletic Club with added squash courts, women’s sections, changes rooms and the swimming pool. It has since been renamed Movati Athletic. Lanca Contracting Limited has been building Brantford for over 44 years. Recognized as the top leading contracting company in Brant, we are very proud to serve our community. THEN – Image taken early 2000. NOW – Image taken April 2016.